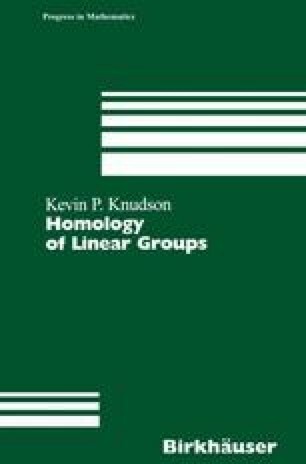 The main focus of this chapter is the computation of low-dimensional homology groups of GL n . The results of the previous chapter show, for example, that H2(GL2(A),ℤ) ≅ H2(GL(A),ℤ) for A local with infinite residue field. Thus, one need only consider the former group. In this case, Suslin completely described the structure of H2(GL2(A),ℤ) —it surjects onto the second Milnor K-group K 2 M (A) and the kernel of this map is the image of H2(GL2(A),ℤ).